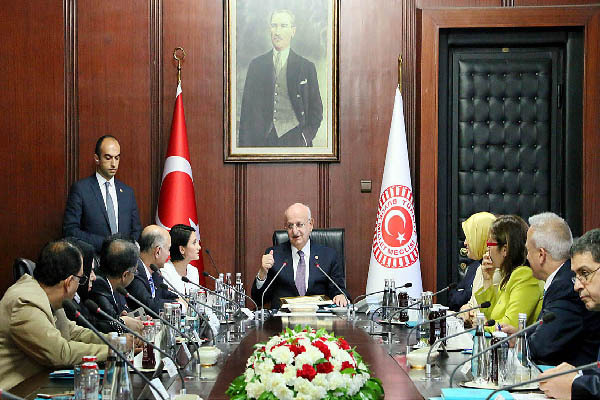 parliamentary delegation, led by Senator Mushahid Hussain, was very warmly received by Speaker of the Turkish Parliament, Ismail Kahraman, at his office in Ankara on Friday. Turkey to express solidarity with the parliament of Turkey. Pakistan delegation, he personally shouted the slogan ‘Pakistan Zindabad’, and warmly hugged the Leader of the Pakistan Delegation, Senator Mushahid Hussain Sayed, a message received here from Ankara said. Parliament can never forget the gesture of support and solidarity of the Pakistan Parliament, whose Senate and National Assembly both passed unanimous resolutions in support of Turkish democracy’. a student leader then, he had organised a ‘Pakistan Zindabad’ Rally in Istanbul. solidarity of the Pakistan parliament with the parliament of Turkey in the aftermath of the July 15 coup attempt, presented a plaque with the text of both resolutions of the Senate and National Assembly. salutes the parliament and parliamentarians of Turkey who showed courage and commitment by immediately convening a session of parliament while the coup was underway, with the Speaker refusing to leave the building despite the bombing by F 16 planes. visitors gallery of the Turkish Grand National Assembly, where the Speaker announced the Pakistan Delegation, to which the entire Turkish Parliament members gave them a standing ovation with applause. sites of the Turkish Parliament which had been attacked by F 16 planes of the coup plotters on the night of July 15.
bombed sites as a mark of respect to the dead and wounded in the coup attempt. Almost 300 were killed in the coup attempt.